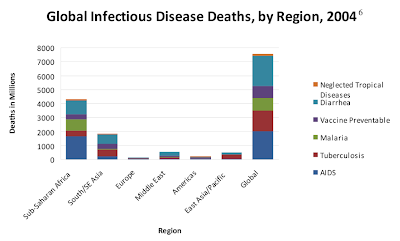 Haq's Musings: Infections Cause Low IQ in South Asia, Africa? It has long been known that IQ scores vary by regions. The lowest average IQ scores in mid-60s have been measured in the African nations of Equatorial Guinea, Cameroon, Mozambique, Gabon, and highest scores of over 100 found in the nations of Singapore, South Korea, China, Japan, and Italy. South Asian and North African IQ scores are in mid 80s. However, the research surrounding intelligence assessment has been highly controversial and tainted by pseudosciences such as craniometry that was used by the Nazis to "prove" the white “race” as the most intelligent. Apparently, this is a compilation of data from "credible sources" and published in respected journals such as American Journal of Psychology. The neutrality and factual accuracy of these studies and data have been questioned by many researchers and scientists. The most common criticisms are that these studies and tests are developed in the European context and they measure mainly problem-solving capability and skills, not innate intelligence. For those who are curious, Pakistanis are included along with Indians in Southern Asia with an average IQ of 84, about 16 points below Europeans' average and almost 21 points behind East Asians' average. East Asians include Chinese, Japanese and Koreans. However, a quick look at the overlapping distribution curves above shows that the differences in intelligence scores within each race are much greater than the difference between races. In the detailed data for South Asians, there is a distinct smaller cluster between 90 and 100, and another bigger cluster between 80 and 90, closer to 90. But then there are a bunch of scores that go as low as 75 which bring down the average to 84. 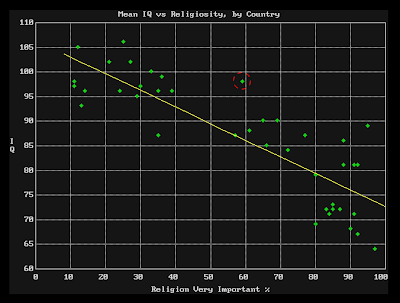 There are some who argue that there is an inverse correlation between IQ scores and religiosity as shown in the above graph. 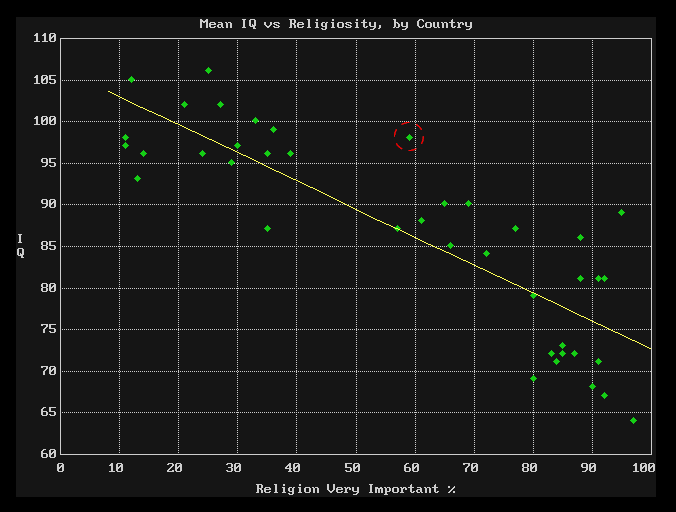 The big exception to this argument is the United States where about 60% people say religion is important to them, and the average IQ is fairly high at 98. The IQ scores are lower in India and Pakistan where, according to a Pew survey on religion, 92% and 91% respondents respectively say religion is important to them. The results of the UNM research study point to the need for fighting infectious diseases in the developing world with greater urgency. Reduction in infectious diseases like diarrhea, malaria, pneumonia and tuberculosis can help improve the cognitive capabilities, and with it, the intelligence and the quality of life of billions in Africa and South Asia. Why Do IQ Scores Vary By Nation? South Asians do better than whites in Colleges and grad school. and look at what African immigrants students deliver. Riaz, Something wrong with this blog. I can't post via my AIM account. All these IQ tests are engineered. You can train people to boost IQ in a reasonable time. In fact a study in US proved how easy it is to increase IQ. Also you seem to talk from both sides of mouth. Sometime back I asked you whether you agree with Chinese that they are the smartest race and you said you don't believe in racial superiority. Then why this post? IQ means jackshit when it comes to achievement. Most of the modern achievement is by whites who have less IQ than chinese. Even within South Asians, we all know citizens of which country has achieved far more in education and related services. "South Asians do better than whites in Colleges and grad school. and look at what African immigrants students deliver." Actually Indians alone earned fantastic reputation in US schools, along with Chinese (who are even better). In UK a study showed Indians to do better in education than even whites. Of course Bangladesis and Pakistanis were far below. It was not deemed politically correct to publish it and a leak of it came out. Mayraj: "South Asians do better than whites in Colleges and grad school. and look at what African immigrants students deliver." The immigrants in the West, particularly the US, are not necessarily representative samples of the overall populations in Africa or South Asia. 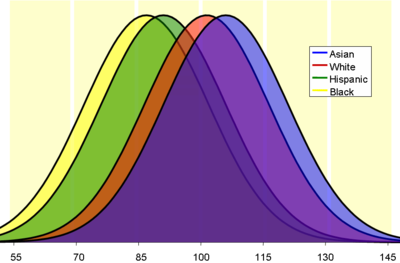 I wrote a post "Are People of Color Less Intelligent" which shows a chart with a broader spread of IQ scores for south Asians than other races. There is a distinct smaller cluster between 90 and 100 and another bigger cluster between 80 and 90. But then there are a bunch of scores that go as low as 75 which bring down the average to 84. I think it has to do with nurture and Flynn effect that impact IQ scores depending on access to education and health care. The emphasis should be to make sure our children dont suffer from disease or malnutrition early on in their childhood. It does affect brain growth. It is also about the kind of environment that a child grows in that determines growth. I have observed Indians have excellent memory but lack the capacity to follow complex instructions the first time. But, we are great lingual abilities. Every Indian knows a minimum of 2 to 3 languages,especially people from the South as they will have to learn English and Hindi in addition to the local language. Booming Cinema industry in each state has ensured that one knows more than 3 languages through popular Cinema. Let me point out proudly that the #1 ranking in Chess,by far the most intellectually challenging game is an Indian, to add icing on the cake from South India. Here's a recent Newsweek column by Sharon Begley on "limits of reason"
For Bill personally and for the Bill & Melinda Gates Foundation, improving global health is a way to fight poverty as well as to save lives. The role of health in social and economic development is highlighted by new research on infectious disease and IQ. Central to our work in global health has been the effort to reduce infectious diseases such as diarrhea and malaria in developing countries. Because these diseases no longer affect the rich world, they haven’t received the attention they should given their truly devastating impacts on poor communities, where they’re prevalent. 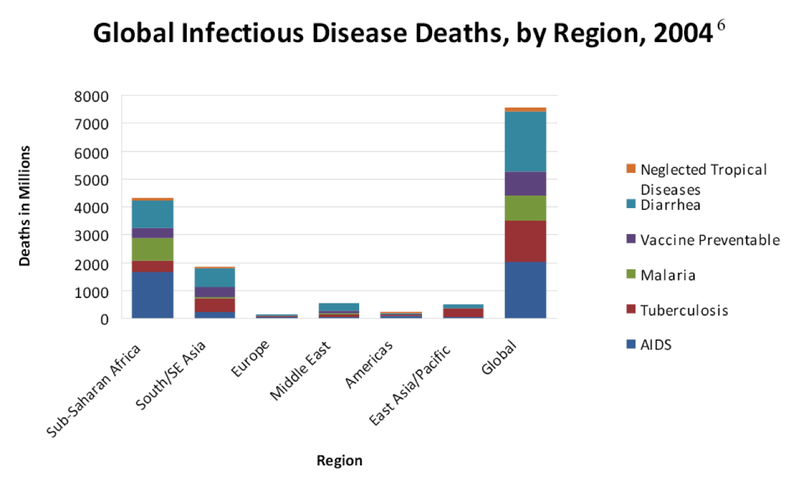 Infectious diseases in developing countries are important not only because of the tragic toll they take in human lives lost, but also because of the tremendous social and economic costs associated with them. Recently I read an article in The Economist, which looks at growing evidence that disease and intelligence are connected in ways that are pretty shocking and troubling. Although more studies are needed, the evidence makes me even more convinced that we need to get after malaria and diarrhea – and many other diseases far too common in the developing world – in a big way. Specifically, new research by University of New Mexico researchers has found that cognitive ability (IQ) is generally lower in places where infectious diseases are widespread, i.e., poor countries. People are just now realizing this. It’s a huge scandal and yet another reason why it’s so critically important to fight infectious disease, which takes a huge toll on people’s ability to learn and climb out of poverty. What’s going on is that fighting off parasites and microbes associated with things like diarrhea and malaria takes away energy that the body needs for brain development. This is especially true among children and infants. Newborns use almost all their metabolic energy for their rapidly developing brains. Analyzing IQ and epidemiological data from around the world, the UNM researchers found that the burden of infectious disease plays a much bigger role in depressing IQ than other possible explanations that have been talked about. There’s also clinical evidence. For example, research in Uganda found that children who survive cerebral malaria, which affects more than a half-million African children every year, continue to suffer significant cognitive impairments, mainly memory and attention deficit, even two years later. The Ugandan researchers found that these children can be helped by weekly sessions where they use cognitive training software on PCs. But this is an expensive, intensive and only partially effective approach to a problem that could have been prevented to begin with. The cognitive problems created by malaria are another strong reason why our foundation has made fighting it a priority. We’re trying to help develop a safe, highly effective and affordable malaria vaccine, while also supporting efforts to improve treatment, diagnostics and other malaria control measures. Widespread infectious disease may even impair kids who don’t get sick themselves. Adults who are ill are less productive; farmers grow less food, for example. Less food means less energy available for their kids and their kids’ brain development. An article in The Lancet medical journal estimates that because of malnutrition, poverty and poor health, over 200 million children under five years are not fulfilling their developmental potential. In the past, some people have suggested that poor countries are poor because the people there have lower IQs. But it’s really the other way around. Poverty breeds disease, which can affect brain development, which reinforces poverty. Improving global health is a way to break this cycle. I have received some racist comments from readers claiming that Brahmins have much higher IQs in the range of 115-120 than the rest of South Asians. Richard Flynn is a recognized expert in IQ measurements and these Flynn's findings. Flynn has reported that animal proteins (meat) given to children raises the IQs significantly based on experiments done in Guatemala. Since Brahmins do not eat meat, and 50% of Indians suffer from iodine deficiency, one would expect their IQ to be lower than Pakistanis. Bill Gates, a strong financier and supporter of vaccination against infections diseases, has a reported IQ of 160. If you want to find out IQs of other famous people like Albert Einstein, Albrecht Haller, Alexander Pope, Andrew Jackson, Andrew Wiles, Andy Warhol, Anthonis Dyck, Antoine Arnauld, Arne Beurling, Arnold Schwarzenegger, Baruch Spinoza, Beethoven, Ben Franklin, Benjamin Netanyahu, Bill Clinton, Bill Gates, Blaise Pascal IQ Score, Bobby Fischer, Carl Linne, and Charles Darwin, please take a look at http://www.kids-iq-tests.com/famous3.html. "In UK a study showed Indians to do better in education than even whites. Of course Bangladesis and Pakistanis were far below. It was not deemed politically correct to publish it and a leak of it came out." I'm not sure which study your referring to, but I live in the UK and there have been countless studies which prove your point, so i'm not sure which political correctness your referring to. You also seem to leave out the fact that Chinese do better then all (including Indians) ethnicities in the UK. While I can't speak for Bangladeshis as for Pakistanis its well documented that most hail from the Mirpur region of Kashmir with some speculating its as high as 70% so its not surprising that most people (with all due respect) from that region came with little to no education, it can't really be considered an overall analysis of Pakistanis in the UK. According to Lynn's worldwide IQ data published by Webster Online dictionary, Pakistanis avg IQ rose from 81 in 2002 to 84 in 2006, while Indians's avg IQ increased by just one point from 81 to 82. A recent UNM study linking IQs and disease burdens can be the basis for rationalizing it. Yet in tests measuring many traits, from intelligence to self-control, the power of the home environment pales in comparison to the power of genes and peer groups. We may think we're sculptors, but the clay is mostly set. A new paper suggests that both metaphors can be true. Which one is relevant depends, it turns out, on the economic status of families. When it came to the mental ability of 10-month-olds, the home environment was the key variable, across every socioeconomic class. But results for the 2-year-olds were dramatically different. In children from poorer households, the choices of parents still mattered. In fact, the researchers estimated that the home environment accounted for approximately 80% of the individual variance in mental ability among poor 2-year-olds. The effect of genetics was negligible. The opposite pattern appeared in 2-year-olds from wealthy households. For these kids, genetics primarily determined performance, accounting for nearly 50% of all variation in mental ability. (The scientists made this conclusion based on the fact that identical twins performed much more similarly than fraternal twins.) The home environment was a distant second. For parents, the correlation appears to be clear: As wealth increases, the choices of adults play a much smaller role in determining the mental ability of their children. (RTTNews) - In what is perhaps the world's largest brain study to date, researchers have uncovered specific genes that are linked to brain size and intelligence. The study, conducted by a team of more than 200 scientists from 100 institutions worldwide, measured the size of the brain and its memory centers in thousands of MRI images from 21,151 healthy people while simultaneously screening their DNA. According to the researchers, a variant in a gene called HMGA2 affected the brain size, as well as a person's intelligence. Remember that every gene contains a unique sequence of four bases namely, adenine (A), cytosine (C), guanine (G) and thymine (T). People whose HMGA2 gene held a letter "C" instead of a "T" at a specific location on the gene possessed larger brains and scored more highly on standardized IQ tests, noted the researchers. According to the study, there was a consistent relationship between subtle shifts in the genetic code and diminished memory centers in people with smaller brains. Since reduced brain size is a biological marker for disorders like schizophrenia, bipolar disorder, depression, Alzheimer's disease and dementia, if we identify the gene variants that deplete brain tissue beyond normal in a healthy person, it can be targeted with a drug to reduce the risk of those diseases, said the researchers. Commenting on the study findings, lead researcher Paul Thompson, a neurologist at the University of California, Los Angeles, School of Medicine, said, "This is a really exciting discovery, that a single letter change leads to a bigger brain. For the first time, we have watertight evidence of how these genes affect the brain. The latest 2012 IQ data published by Richard Lynn and Tatu Vanhanen puts mean IQ of Pakistanis at 84 and of Indians at 82.2, and Bangladeshis at 81. Each country has big std deviations and large positive outliers. The highest IQs are reported for East Asia (100+) and the lowest in sub-Saharan Africa (just over 70). "Our results suggest that when you are poor, money is not the only thing in short supply. Cognitive capacity is also stretched thin," said Harvard economist Sendhil Mullainathan, part of an international team that conducted the study. In a series of experiments, researchers from Harvard, Princeton and other universities in North America and from Britain's University of Warwick found that pressing financial worries had an immediate impact on poor people's ability to perform well in cognitive and logic tests. Far from signalling that poor people are stupid, the results suggest those living on a tight budget have their effective brain power, or what the researchers called "mental bandwidth", dramatically limited by the stress of making ends meet. On average, someone weighed down by money woes showed a drop in cognitive function in one part of the study that was comparable to a 13 point dip in IQ, and similar to the performance deficit expected from someone who has missed a whole night's sleep. "Previous views of poverty have blamed (it) on personal failings, on an environment that is not conducive to success," said Jiaying Zhao, an assistant professor of psychology at the University of British Columbia in Canada. "One month after the harvest, they're pretty rich, but the month before - when the money has run out - they're pretty poor," Mullainathan said in a report of the research, which was published on Thursday in the journal Science. "What we see is that IQ goes up, (when they are rich)... errors go way down, and response times go way down." There are genetic variations between races, but they don’t matter. It is co-operation that brings progress to our species. Is it necessary to believe that racial differences are small and skin-deep in order not to be a racist? For the first half of the last century, science generally exaggerated stereotypes of racial difference in behaviour and assumed that they were innate and immutable. For the second half, science generally asserted that there were no differences — save the obvious, visible ones — and used this argument to combat prejudice. Yet that second premise is becoming increasingly untenable in the genomic era as more details emerge of human genetic diversity. We will have to justify equal treatment using something other than identity of nature. Fortunately, it’s easily done. Perhaps people of Ashkenazi Jewish descent have high average IQs because for centuries their ancestors worked almost exclusively in professions such as money-lending, where exceptional literacy and numeracy were rewarded with greater fecundity. Or perhaps Chinese people show greater conformity because for centuries those who could stomach Confucian rote-learning and obedience got to have more surviving children. These are no more far-fetched arguments than to suppose that ancestral Inuit with genetic adaptations for coping with the cold had more offspring. So Wade is absolutely right that the old assumption that human behaviour did not evolve much after the divergence of human races at the end of the old Stone Age has to be wrong. The comforting message that biologists sent to social scientists in the 1960s — that they were sure there was no biological basis for race, which could instead be regarded as a social construct — is bunk. True, the boundaries of races are blurred, and the differences between individuals dwarf those between average members of different races, but differences there are, and not just in skin pigment. The more we look, the more genetic variation we will find between races, as well as between individuals, so we had better get ready to deal with such discoveries, if only for medical reasons. Some diseases afflict certain races more; some drugs work differently in different races. Beyond the Flynn effect: new myths about race, family and IQ? In the garden of a terraced house in Oxford, on the hottest, sunniest day of the year, I meet Professor James R Flynn, an American-born academic who is a hero to many people. More than 30 years ago, he discovered a phenomenon that revolutionised the study of IQ and seemed finally to settle the argument over nature versus nurture. He showed that, across the world, average IQs had risen by roughly three percentage points every decade since at least 1930, and probably much longer. Since evolution doesn’t work fast enough to produce genetic upgrading on that scale, it seemed that environment must be the dominant influence. According to Flynn, rising IQs went hand-in-hand with modernisation, which involves more years of education and more jobs that require analytic abilities and abstract thinking. The belief that better schooling, and positive discrimination in favour of disadvantaged children, could make a difference was seemingly vindicated.